The offer by Pakistan to open the doors of Kartarpur Gurudwara for devotees from India without formal visa is a very positive development in the year when we are celebrating 550th anniversary of Guru Nanak’s birthday. Guru Nanak was revered by the devotees from both leading religions of the region that time namely Hindus and Muslims. Ironically, it was at Kartarpur when both Hindus and Muslims claimed his body for the last rites as per their own religion. Guru Nanak preached ‘simple living and high thinking’ and was bold enough to point out wrong practices cutting across all prevailing religions of the time. That is the reason that Guru’s disciples were known as students or Sikhs. Unlike most other Godmen, Guru Nanak believed that human beings should work hard and earn first ; share ten percent of their earning with destitute, and then and thereafter, pray to the Almighty thanking him for all his blessings. He had a great vision and believed in equality between all humans and also between the genders. It is no surprise, therefore, that at the time of independence only Punjab and Bengal had classless societies. Also, Sikh women have had a very pivotal role as anchors of the family and have worked equally hard and supported their spouses in their endeavours. During the swearing in ceremony of PM of Pakistan on 18 August 18, prominent politicians including our PM and cricketer friends of Imran Khan were invited but only Navjot Singh Sidhu, a three-in-one cricketer turned politician and TV personality, showed up. The Kartarpur initiative was the outcome of prolonged Track II diplomacy for normalisation of relations between the two countries and two neighbouring border states of Punjab on either side. The intent was shown by Pakistani establishment to Sidhu, the sole representative from Indian side. Sidhu has always been batting from the front foot and punching above his weight. He seems to be a politician in a hurry and is not content in growing through the ranks. Ironically, it may be recalled that he was met with BJP leaders at Wagah border on return from Pakistan on one of his earlier visits to that country ; was given a BJP ticket from Amritsar to contest Lok Sabha elections which he won and became an MP. After having left the BJP and having won an MLA seat from Congress, he was insistent on being given the Deputy CM post which Captain Amarinder opposed vehemently. In recent times, Sidhu’s actions have neither been aligned with the ruling party in the state nor the Centre and he has been operating like Rambo, a one man army. Sidhu was naive in saying that Captain Amarinder Singh was not his Captain. It smacks of disloyalty and impropriety. It is a sad thing that on the eve of Guru Nanak’s 550th birth anniversary and laying the foundation stone for Kartarpur Corridor, the event became politicised on both sides with politicians trying to claim fame and vying for political space. Gen Bajwa and other uniformed officers were also present overseeing actions and utterances of their politicians and gauging the Indian politicians. The conduct of Captain Amarinder Singh, the CM of Punjab on this issue has been praiseworthy showing him as an astute statesman and a matured politician. Sushma Swaraj’s statement has also been complimentary. Both the seasoned politicians feel that Pakistan cannot be allowed to work in water tight compartments and try and normalise relations piecemeal. It cannot throw piece crumbs at India without showing its genuineness and resolve to stop proxy war on India and terminate all terrorist activities including training, equipping and launching attacks on Indian soil. It has to be a concerted effort on the lines of January 2004 commitment to state that Pakistan will deny the use of their soil or territories under its control to perpetuate terrorists attacks onto India and will share the actionable intelligence on sub conventional operations with India. Israel and Jordan, erstwhile enemies; have such an agreement in place, in combating sub conventional threats. Pakistan politically and economically is at crossroads and finds itself between the devil and the deep sea. Trump, a first term politician with an uncanny economic acumen has clearly stated that in spite of America pouring billions of dollars into Pakistan, the latter has done precious little in return for America. The economic squeeze has been felt by Pakistan and Imran Khan has clearly gone with a begging bowl to say that whosoever can give them economic aid, they will have no hesitation in approaching that nation or organisation. Pakistan’s time tested friend China has already embroiled it in a debt trap in its One Belt One Road (OBOR) ambitious plan and China Pakistan Economic Corridor (CPEC) is an integral part of this plan. Pakistan has realised that like some African and Central Asian nations, it is fast becoming a colony of China. The recent Taliban attack on Chinese embassy in Afghanistan was the manifestation of such sentiments in Afghanistan and similar attacks on Chinese population astride the corridor by Baluchi separatist cannot be ruled out. Sri Lanka, Maldives, Myanmar and Bangladesh have already felt the heat the Chinese money has generated in their respective economies and are vary of China’s hegemonic role in the sub-continent and Indian Ocean region. Pakistan, therefore, is in search of friends and although it cannot be friends with India in the near future, it gains immensely economically, by normalising its relations with India. The erstwhile cricketers should not forget the art of playing the well planned and spaced out five to six days test match series. They are trying to play T20 series without the requisite political acumen and maturity. 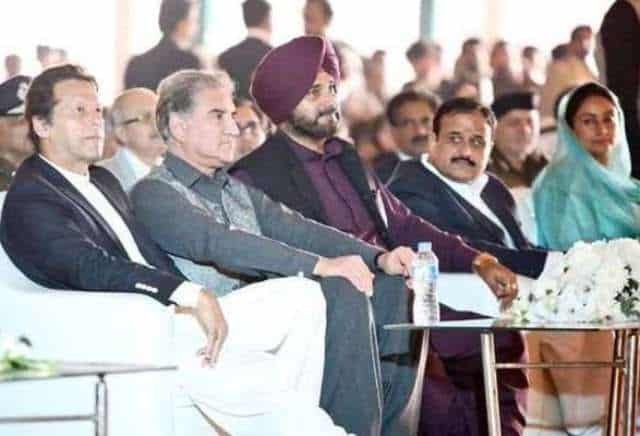 PM Imran Khan may desire to deal directly with Sidhu because of his comfort zone but he has to realise that Sidhu does not have the endorsement from his CM or the PM of India. Imran Khan must learn the art of dealing with PM Modi and his Government and cannot wish away the political equation. Netanyahu and Obama did not enjoy good chemistry and both waited for the second term hoping the other would not get re-elected but both got re-elected and did not achieve much in two complete terms. PM Modi has laid down the intent and scope for normalising the relations in a calibrated manner and Imran must utilise the space that has been provided between the statements of Our PM and Minister for External Affairs. Imran should stop betting on the wrong horse, and must bat and ball, sensibly and astutely.